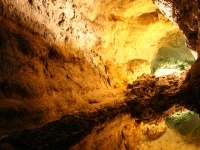 In the northern part of Lanzarote, close to the Monte de la Corona volcano, is a spectacular system of underground grottos known as La Cueva de los Verdes. This is one of the largest volcanic galleries in the world, at just over four miles (6km) long, formed approximately five thousand years ago in a prehistoric eruption when a massive stream of lava boiled down to the sea, hardening around the spaces inflated by gases. Where the tunnel enters the sea there is an underwater section called the Tunnel of Atlantis. More than a mile (2km) of these grottos is accessible to visitors, and lighting effects have been added to accentuate the contours and colours of the weird shapes resulting from the lava flows. Feeling like a journey into the mysterious bowels of the earth, exploring the tunnels is a thrilling experience. Tours take just under an hour and are conducted in Spanish and English. Those with mobility issues may struggle negotiating the uneven surfaces, but tour guides are generally accommodating and adjust their pace to suit the group as a whole. Evening concerts are sometimes held in the caverns, and it is incredible to hear the music reverberating off the ancient walls. Opening times: Daily from 10am to 6pm. Last tour at 5pm. Admission: €9 (adults), €4.50 (children aged 7 to 12).